Are you planning a party this summer? Birthday in a Box is a great place to go on online for all your party needs. From party plates, to balloons, teen parties to baby’s first birthday they have something to make your party very special! 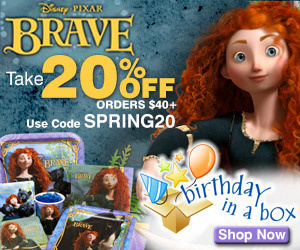 Disney Pixar Brave themed parties are likely to be very popular as soon as the movie is released this month so get your supplies now! Birthday in a Box makes planning a party a lot of fun. They have over 130 party themes for you to choose from so there is sure to be something that you will love! New Printable Coupons for Breakfast Products!